Large and bold glazed and decorated stoneware lamp with dark stained wood accents. American 1960s Sold without the shade. 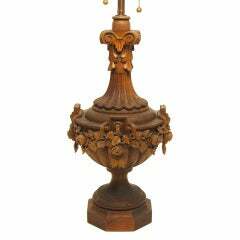 A large and impressive, beautifully carved wood lamp. Lovely form with carved leaves and flowers. Newly re-wired. Early to mid 20th century. 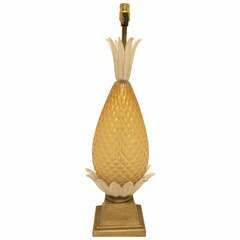 Large impressive Italian glass lamp in the shape of a pineapple on painted wood plinth. Attributed to Barovier &amp; Toss, Italy, mid-20th century. Newly re-wired. 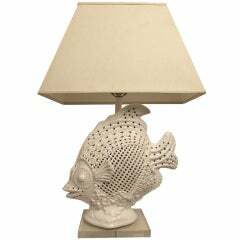 A very large cast ceramic and hand modeled fish lamp with hand cut open work. Measurements include shade. Italy, mid 20th century. American midcentury table lamp with a large Lucite square frame housing three stacked chrome rectangles. Midcentury ceramic gold glaze lamp. Measures 31" top of finial. Shade is damaged. Elegant 1950s painted pottery table lamp with wooden lacquer base. Fitted with silk lampshade. The large bottle-form lamp in a richly-textured burnt-orange crater-glaze.